"Thanksgiving on a bun any time of year! Use stuffing mix and cranberry sauce to turn ground turkey into an easy and delicious dinner. Serve with sweet potato fries with chipotle ketchup." Heat the butter in a skillet over medium-low heat, and cook and stir the onion and celery until the onion is soft and translucent, about 5 minutes. Place the cooked onion and celery in a large bowl with the ground turkey, stuffing mix, and eggs; mix to thoroughly combine. Form the mixture into 16 patties. Unlike hamburger, these patties will not change shape while cooking, so make them even in size. Grill the turkey burgers on the preheated grill until no longer pink in the center and the juices run clear, about 5 minutes per side. An instant-read thermometer inserted into the center should read at least 165 degrees F (74 degrees C). 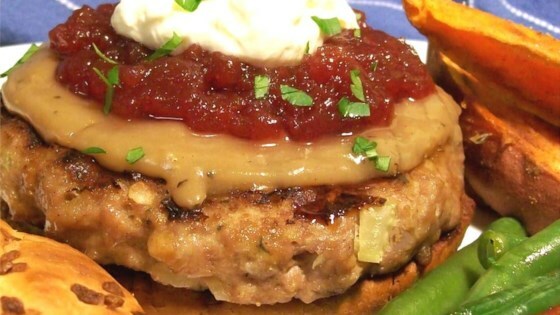 Place each patty on a hamburger bun, and top with cranberry sauce and a dollop of whipped cream cheese to serve. Great idea! Tried as soon as I got this recipe. This is really tasty. I made acouple as written and then added poultry seasoning and fresh sage to the next ones. Both were very good. I made these for dinner tonight. Good, but not exciting. I'd make them again if I had the ingredients on hand, but I don't think I'd go out of my way to make them. Not crave-able. I made this for dinner tonight- I only had 1 lb of ground turkey and no celery. I used one egg and 3 oz of stuffing. Excellent! My family loved it and we will be eating it again soon!